Purposal :- Brilliance and radiance of the sun for energy, dynamism, power. 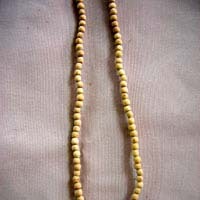 This mala is made from genuine naterallly fragrant sandwood mala is used for japa. This Mala Represents Lord Vishnu, rama & Brahma . It is very useful in the purification of the bady . Chandan Mala results in a Glow on Face. Purpose:- 2 Mukhi Rudraksha Mala is used for maintaining relationships with one & all. Purpose: 4 mukhi rudraksha Mala helps the wearer to increase his/her focus & concentration in work or studies. Helps the wearer/possesor to explore the creativety. Purpose: 6 mukhi Rudraksha Mala helps the wearer/possessor to control nervousness & gain self confidence. Purpose: 7 mukhi Rudraksha mala is considered to be the house of Goddess Mahalaxmi which helps its worshipper to reduce any kind of financial crisis & grow in monetary terms. One can also use it for performin mahalaxmi japa on mala. 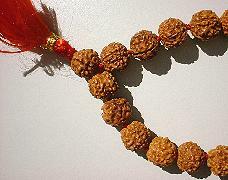 Purpose: 8 mukhi Rudraksha Mala is the most natural symbol of ashtvinayak (i.e. 8 forms of Lord ganesha) also known as the obstacle remover. 8 mukhi Rudraksha helps the wearer to reduce obstacles in their path & be successful in life. 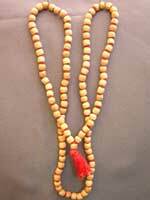 This mala is an excellent tool for Ganesha worshippers one can wear this mal or perform japa on it for Lord Ganeshas blessings. Rudraksha is a dried herbal fruit which has been long valued for spiritual and medicinal properties. The word Rudraksha means the tear drop of Lord Siva, hence it has a great religious value. Rudraksha Mala is the usual ornaments of Lord Siva. There are reasons beyond the range of human mind why the Lord accepted Rudraksha. 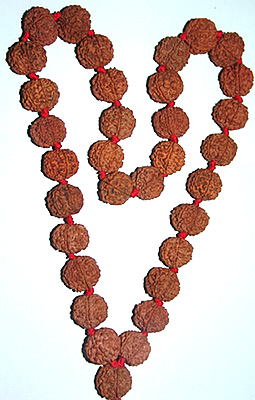 Hindu saints and devotees wear Rudraksha Mala. 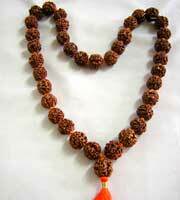 Rudraksha Mala is effective for Tuberculoses and lung diseases. Continues wearing of Rudraksha Mala relieves depression mental tension, stimulates the central nervous system, controls blood pressure, builds up self confidence and cures some skin diseases. It is good to heal cold and asthma if worn during meditation (Japam). 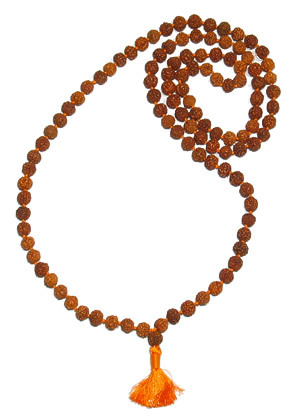 Women can also wear Rudraksha Mala except during menstruation. Honey coloured Rudrsksha beads are best.